Prime Minister Sheikh Hasina today gave financial assistance to the gallantry award-winning freedom fighters (FFs) and their heirs. The prime minister handed over the cheques for the financial assistance to the 18 families of the freedom fighters, who received gallantry awards, at a function at Ganabhaban here this afternoon. 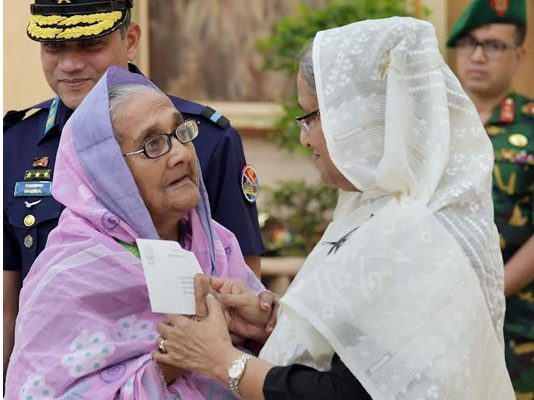 The financial assistance was provided following the application of the FFs, their families and successors to the prime minister at a function on November 21 last at Dhaka Cantonment marking the Armed Forces Day. They applied for the financial assistance to the premier for constructing houses, meeting their medical treatment cost and education expenditure of their children as well as removing financial insolvency. Later, the prime minister received donation from the Shahjalal Islami Bank Ltd for her Relief and Welfare Fund. Chairman of the bank Anwar Hossain Khan handed over a cheque for the money to the premier.